The National Maritime College of Ireland (NMCI) is set to open it’s doors to the public for the annual College Open Day on October 22nd. From transition year students, to leaving certificate students to teachers and parents, the NMCI will be brought to life on the day. The college will open from 10:00 until 15:00 where members of the public will have an opportunity to tour the state of the art facilities at the NMCI, a $100million dollar facility, Europe’s leading Maritime College. If you think a Maritime Career is for you then this is the day where you can find out about the different degree courses which are on offer at the NMCI. Whether a B.Eng. in Marine Electrotechnology, B.Eng. in Marine Engineering or a B.Sc in Nautical Science peaks your interest you will have an opportunity to find out about each of the courses on the day. As Ireland’s designated centre for the education and training of personnel for the Merchant Marine, NMCI can provide you with the education to get started with a career at sea. Want further details on each of our degree courses? Click here. A recent study by Drewry estimates the current officer supply to be 610,000, representing a shortfall of 19,000 personnel. This shortfall is forecast to rise to 21,700 by 2018 given that there will be a requirement for an additional 38,500 officers by this time. This highglights the shortgae of seafarers and confirms the need for recruitment and training well into the future to meet international needs. This demand for seafarers means that those who graduate from the NMCI are in demand amongst the Industry. As there is a placement element amongst these courses we have partnered with key industry leaders to give our students seagoing time. A number of our industry partners will also be present on October 22nd to discuss employment opportunities with students. 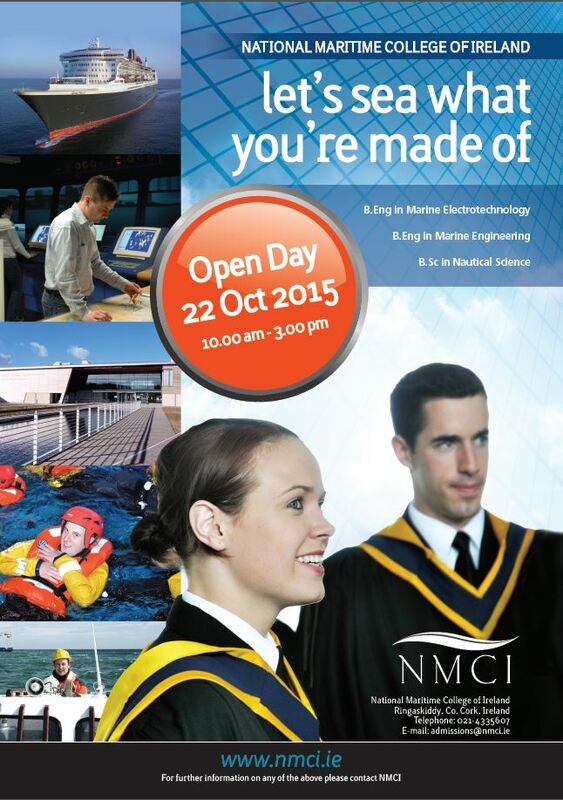 If you believe a Maritime Career is for you then why not visit us here at the NMCI on October 22nd. Take the journey with the NMCI. Is there a requirement to pre-register for the Open Day? No there is no requirement for individuals to register for the open day.